Geothermal energy (literally heat from the earth) has become the "green" energy alternative of choice because it is natural, clean, renewable, reliable, efficient and inexpensive to operate. 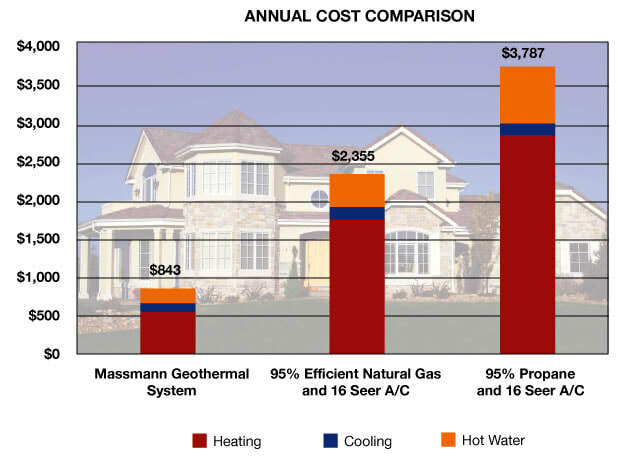 Geothermal heating & cooling is the most economical, clean, non-polluting, proven heating & cooling technology available today. It will save you up to 80% of the cost of heating and cooling compared to a conventional system. For every unit of energy used to operate the system, 3 to 4 units of energy are produced. Geothermal heating & cooling uses a renewable energy resource available from your own property. Geothermal heating is flame-less, therefore producing no health & safety concerns as associated with fossil fuels. Rack up the savings with us! We also give referral credits! Let us tell you how to save. Protect Your Investment - Get your Geothermal installation done right. We make our customers happy! Find out what they are saying about us. Stay up to date with the latest Industry News for new legislation and credits.